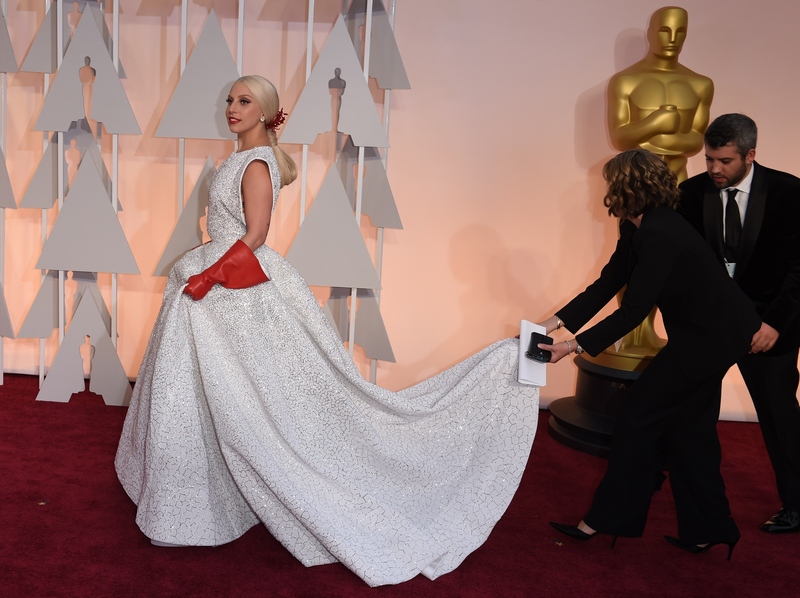 The one Oscar ensemble that undoubtedly will have everyone talking on Monday morning is Lady Gaga's red gloves and custom-made Alaia ball gown. The gown was giant, sparkly, and expertly-crafted, but those crimson gloves really stole the show. Between the gown, the gloves and, well, the fact that it's Lady Gaga, the look was a quirky combination of gorgeous, feminine, shocking, and just the right amount of weird. But performing at the Oscars isn't the only exciting thing the singer has had on her agenda lately— Gaga recently got engaged to long-time boyfriend Taylor Kinney. And the heart-shaped engagement ring? Pretty epic. Given this, everyone had to wonder if Lady Gaga wore red gloves to hide her engagement ring. Would have been pretty rad, right? Frankly, focusing on her engagement would have been a little demeaning for such a talented performer. Well, that wasn't quite the case. Gaga told Ryan Seacrest that she had planned to wear the gloves before the engagement, and simply followed through with the look. Oh well. OK, so I guess the gloves weren't really making the statement that some might have guessed. But let's just think about how cool it would have been if they were making that statement, shall we? Sure, Lady Gaga is thrilled that she's engaged. She's ecstatic and very, very in love. That much is clear form her Instagram account alone. But is she at the Oscars to celebrate being engaged? No. And why would she want to spend an evening that's supposed to celebrate not only her talent, but the talents of so many other amazing women talking about anything other than that? She, and so many other actresses and performers at the Oscars, would probably rather not focus on their relationships or, I dunno, their manicures throughout the evening. The Representation Project, a group that strives to fight sexism and expose gender stereotypes in the media, recently started the #AskHerMore campaign — an effort to encourage journalists to ask female celebrities more than "who are you wearing?" on the red carpet. And how amazing would it have been if Gaga's gloves were an #AskHerMore statement? What if Gaga had been trying to say, "Yes, I'm engaged and happy. But ask me more than about my ring, please. Ask me more than about my relationship or my significant other. I'm more than just that and I'm HERE for more than that," with the red gloves? Even if the gloves were simply just Gaga being Gaga and adding her signature, slightly crazy mark to an outfit and not trying to speak to a larger message, the idea that they could have been is still something important, I think. Anything that gets us thinking about women beyond the scope of simply their relationships or their newest diamonds is something important, don't you think?